Mt. Pinatubo Crate - Worth the walk! Book Trekking & Hiking Tours to Mt Pinatubo! "The Sleeping Giant Awakens" In June 1991, after more than four centuries of slumber. In June 1991, after more than four centuries of slumber, Pinatubo Volcano in the Philippines erupted so violently that more than 5 billion cubic meters of ash and pyroclastic debris were ejected from its fiery bowels producing eruption columns 18 kilometers wide at the base and heights reaching up to 30 kilometers above the volcano’s vent. In its wake 847 people lay dead, 184 injured, 23 missing, and more than 1 millon people displaced. Hundreds of millions of dollars in private properties and infrastructure lay in ruins which would require tens of billions of pesos and several years to rebuild. For months, the ejected volcanic materials remained suspended in the atmosphere where the winds dispersed them to envelope the earth, reaching as far as Russia and North America. This phenomenon caused the world’s temperature to fall by an average of 1 degree Celsius. Clearly, Pinatubo’s eruption signals the world’s most violent and destructive volcanic event of the 20th century. Early morning(EST. 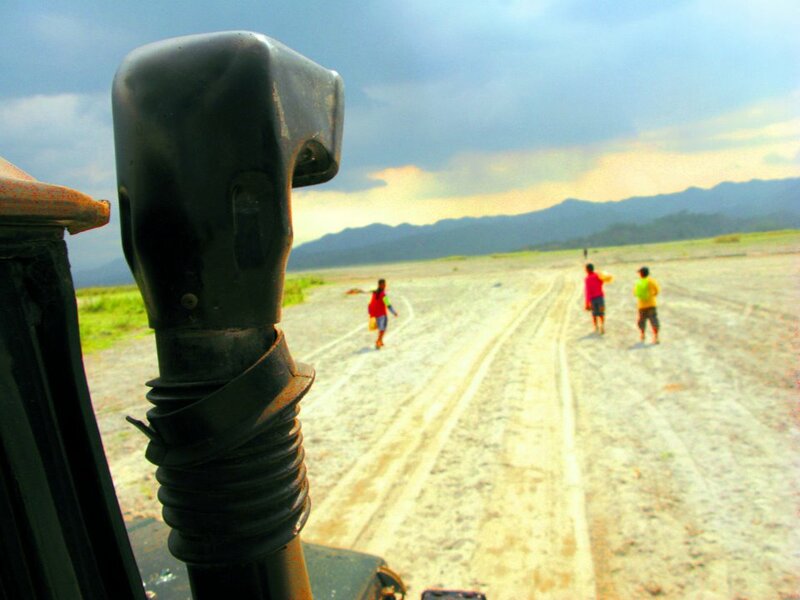 4AM) will be heading Capas Junction, where you will be transferred into a 4x4 vehicle and start your Pinatubo Adventure. Mount Pinatubo is part of a chain of volcanoes which lie along the western side of the edge of the Island of Luzon. Before the Catastrophic eruption of 1991, Pinatubo was an inconspicuous volcano, Unknown to most people in the surrounding areas. Today the mountain is one of the famous tourists attraction it the country and attract many tourists. Trekking in the Pinatubo is a life time experience, It’s a 1.5 hour 4X4 jeep ride up to the starting point where you begin walking up to the crate, takes about 2 hours. - Guest MUST be in good shape for the walk, it is not an easy trek for old people and kids. However most of the people doing it and even people on their 60’s. 08:15am Est. Arrival to the starting point where you leave the jeep and walk towards the Crate. 10:30am Est. Arrival to the Crate, there you may sit and rest from the long walk, Eat your snack and even Swim at the Crater lake. 01:30pm Start walking to the 4X4 vehicle. 04:00pm Est. Arrival to the Jeep. 05:00pm Est. Arrival to the Aetas Village, Where you may see the oldest natives of the Philippines and they way their lifestyle was preserved. 06:00pm Depart the Jeep and back to the vehicle that will take you back to Manila. 08:30pm Est. Arrival to Manila/Your Hotel. Must have: Guest must have with him at least 3 litters of water each. Check out our Pagsanjan Falls tours!